When a loved one dies, it’s often difficult to figure out what to do with their clothing, especially items with sentimental value and/or that are too worn to pass on to others. 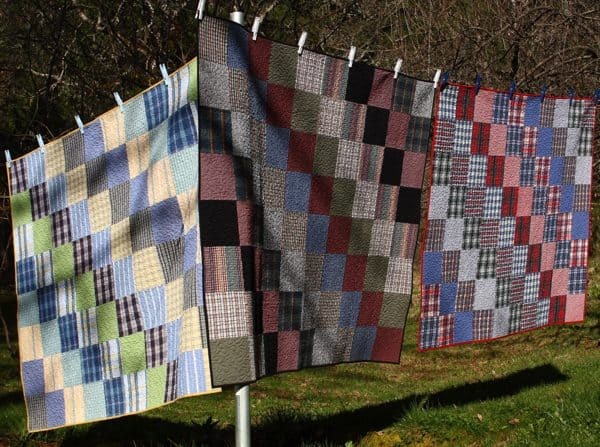 Instead of boxing up the clothes and storing them in the attic or basement, you can use them in a quilt. Creating a memorial quilt from clothing requires just basic sewing equipment and skill. Even a beginner can successfully create a beautiful memorial quilt to provide comfort during this time of grief and for years to come. Prepare the clothing – Sort the clothing and read the care labels. Make sure that all clothing is clean and can be laundered together. Wash and dry the clothing and do not use any type of fabric softener in the washer or dryer. Plan the quilt – Lay out the clothes and select special features around which to plan the quilt. Look for logos, pockets and other items of interest. Measure these and determine what size grid would be best for your quilt. Usually a 5-inch grid is the easiest to work with. Sketch your quilt on paper (graph paper, if possible) to make sure everything fits together the way you want it. Iron and stabilize the fabrics – Cut the garments apart at the seams and iron, using a press cloth over t-shirt logos or other heat-sensitive areas. Fuse a lightweight iron-on stabilizer product to the back of any fabrics that are thin or stretchy, following the manufacturer’s directions. Pellon brand 906F or P44F works well and is readily available in any Joann’s store. Cut and sew the quilt top together – Cut the pieces an inch bigger than the desired finished size and sew them together with ½-inch seams. Sew the pieces together in rows or sections and then sew the rows or sections together to create the quilt top. Finish the quilt – Layer your finished quilt top on batting placed atop backing fabric and pin securely or baste. Tie the layers together or quilt them by machine (hand quilting is usually not advisable for quilts made from clothing). Bind the quilt and you’re done! For more detailed information on how YOU can create a memorial quilt, just visit CustomMemorialQuilts.com.